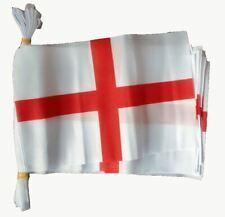 • 5x3 ft England flag, 4 x 10m St George bunting & 100 x flag picks. 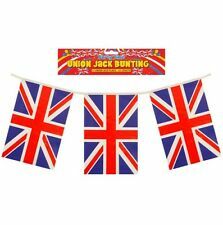 • High quality plastic bunting (Approx. 10m length, 20 flags, flag size: 30cm x 20cm). 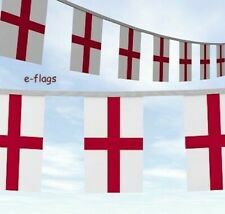 ENGLAND FLAG BUNTING. 20 X 12" X 9" FLAGS. 4M Of PVC English Flag Bunting. Strong PVC Plastic Therefore Suitable For Indoor And Outdoor Use. Size: 13 Feet. Reasons to buy from Quickdraw. Material : Plastic. 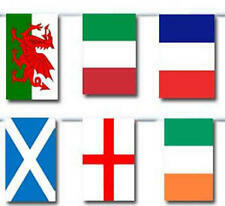 ♥ Flags quanity: 28pcs. 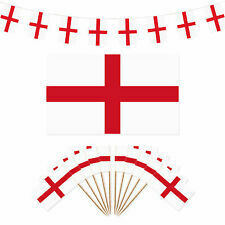 ♥ 1 x 33ft / 10M England Flag Bunting. ♥ Length: 10M / 33ft. ♥ Material: Fabric. We will be glad to reply and help you to solve any problem. With a wide range, good quality, reasonable prices and stylish designs. 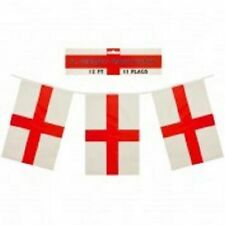 England - Fabric bunting Quick Free 1st class post - Discounted Seconds! Handmade London bus patterned fabric bunting. Completed ribbon length is 150cm and the banners hang 14cm, all sizes approx. as it is hand made. I have loads of other bunting for sale so check out my other items! Length: 10M / 33ft. Material: Polyester Triangle Bunting. Warm Reminder With a wide range, good quality, reasonable prices and stylish designs. We will try our best to solve the problem for you. Products without any quality?. Handmade London themed patterned fabric bunting. Completed ribbon length is 150cm and the banners hang 14cm, all sizes approx. as it is hand made. I have loads of other bunting for sale so check out my other items! 16M Of PVC English Flag Bunting. Strong PVC Plastic Therefore Suitable For Indoor And Outdoor Use. Reasons to buy from Quickdraw. Material : Plastic. Handmade UNION JACK fabric bunting. Completed ribbon length is 150cm and the banners hang 14cm, all sizes approx. as it is hand made. POLYESTER TRIANGLE BUNTING. 20 X 12" X 9" FLAGS. We will be glad to reply and help you to solve any problem. With a wide range, good quality, reasonable prices and stylish designs. Products without any quality?. The flags are evenly spaced and sewn to bunting tape. The bunting tape is sufficiently strong to allow you to join several lengths together to create longer strings. 8M Of PVC English Flag Bunting. Strong PVC Plastic Therefore Suitable For Indoor And Outdoor Use. Size: 26 Feet. Reasons to buy from Quickdraw. Material : Plastic. "Red / White / Blue" Fabric Bunting. Bunting is single sided and pinked on edges. 3m with 10 flags per 3m. If you buy more than one 3m length (eg 5 x 3m and would like it as one long 15m length). 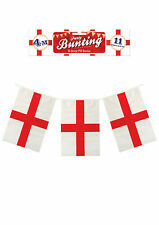 England UK Bunting Flags English Decorations Garden Party Marks & Spencer NEW!